The Sarcophagus of Ahiram in its current location (Lebanon). The sarcophagus was found following a landslide in the cliffs surrounding Byblos (in now modern-day Lebanon) in late 1923, which revealed a number of Phoenician royal tombs. The tomb of Ahirom was ten metres deep. A coffin made it [Pil]sibaal, son of Ahirom, king of Byblos, for Ahirom, his father, lo, thus he put him in seclusion. Now, if a king among kings and a governor among governors and a commander of an army should come up against Byblos; and when he then uncovers this coffin – (then:) may strip off the sceptre of his judiciary, may be overturned the throne of his kingdom, and peace and quiet may flee from Byblos. And as for him, one should cancel his registration concerning the libation tube of the memorial sacrifice. The formulas of the inscription were immediately recognised as literary in nature, and the assured cutting of the archaic letters suggested to Charles Torrey a form of writing already in common use. A 10th-century BC date for the inscription has become widely accepted. Ahiram himself is not entitled a king, neither of Byblos nor of any other city state. It is said that he was succeeded by his son Ithobaal I who is the first to be explicitly entitled King of Byblos., which is due to an old misrerading of a text lacuna. According to a new reconstruction of the lacuna the name of Ahiram's son is to be read [Pil]sibaal, and Ithobaal is to abandon. The early king list of Byblos is again subject to further study. Michael Browning "Scholar updates translation of ancient inscription", in: The Palm Beach Post, Sunday, July 3, 2005 p. 17A. 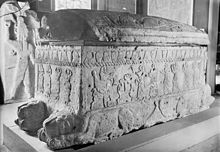 Wikimedia Commons has media related to Category:Sarcophagus of Ahiram. ^ The date remains the subject of controversy, according to Glenn E. Markoe, "The Emergence of Phoenician Art" Bulletin of the American Schools of Oriental Research No. 279 (August 1990):13-26) p. 13. "Most scholars have taken the Ahiram inscription to date from around 1000 B.C.E. ", notes Edward M. Cook, "On the Linguistic Dating of the Phoenician Ahiram Inscription (KAI 1)", Journal of Near Eastern Studies 53.1 (January 1994:33-36) p. 33 JSTOR. Cook analyses and dismisses the date in the thirteenth century adopted by C. Garbini, "Sulla datazione della'inscrizione di Ahiram", Annali (Istituto Universitario Orientale, Naples) 37 (1977:81-89), which was the prime source for early dating urged in Bernal, Martin (1990). Cadmean Letters: The Transmission of the Alphabet to the Aegean and further West before 1400 BC. Winona Lake, Ind. : Eisenbrauns. ISBN 0-931464-47-1. Arguments for a mid 9th -8th century B.C.E. date for the sarcophagus reliefs themselves—and hence the inscription, too— were made on the basis of comparative art history and archaeology by Edith Porada, "Notes on the Sarcophagus of Ahiram," Journal of the Ancient Near East Society 5 (1973:354-72); and on the basis of paleography among other points by Ronald Wallenfels, "Redating the Byblian Inscriptions," Journal of the Ancient Near East Society 15 (1983:79-118). ^ Pierre Montet, "Les fouilles de Byblos en 1923," L’Illustration 3 (May 3, 1924), 402–405. ^ a b Torrey, Charles C. (1925). "The Ahiram Inscription of Byblos". Journal of the American Oriental Society. Journal of the American Oriental Society, Vol. 45. 45: 269–279. doi:10.2307/593505. JSTOR 593505. ^ J. Leclant, "Les relations entre l'Égypte et la Phénicie du voyage de Ounamon à l'expédition d'Alexandre", in The role of the Phoenicians in the Interaction of Mediterranean Civilisations, W. Ward, ed. (Beirut: American University) 1968:11. ^ by René Dussaud, in Syria 5 (1924:135-57). ^ Vance, Donald R. (1994). "Literary Sources for the History of Palestine and Syria: The Phœnician Inscriptions". The Biblical Archaeologist. The Biblical Archaeologist, Vol. 57, No. 1. 57 (1): 2–19. doi:10.2307/3210392. JSTOR 3210392. This page was last edited on 18 March 2019, at 14:28 (UTC).